The Geospatial Engineering research group and the recently established Spatial Analytics and Modelling lab (SAM) at Newcastle, along with the Geospatial Institute at Nottingham University, have been awarded a prestigious EPSRC Centre for Doctoral Training in Geospatial Systems. The CDT will train a national cohort of over 50 interdisciplinary geospatial engineers, scientists and practitioners that will help deliver the collective benefit of geospatial data and technology to the UK. The CDT is a unique opportunity for academia to work with the geospatial industry and wider applied user base to ensure that the UK prospers in a global geospatial market experiencing rapid growth, and to address major global societal issues, such as climate change impacts, urban sustainability, spatially resourcing public health, and removing spatial barriers to social inclusion and healthy aging. The CDT will provide specialised training in geospatial technology, data management, analytics, simulation and visualisation, and also develop student’s skills in the advanced computing technologies and AI approaches that are transforming the use of geospatial data; knowledge and skills that will underpin their 3-year interdisciplinary PhD-project. The world leading interdisciplinary geospatial research and expertise established by Nottingham’s Geospatial Institute and Newcastle’s Geospatial Engineering group and the £2.25million investment in the Spatial Analytics and Modelling lab (SAM) at Newcastle with the aim to foster interdisciplinary geospatial research between engineers, social scientists, computer scientists, mathematicians and statisticians and the medical sciences were key to the success of the award of the CDT. For those who were not present at GISRUK 2018 this year in Leicester we are delighted to announce that we are hosting GISRUK (GIS Research UK) in April 2019! And for those that were at Leicester, what follows is a reminder about some of the key details. 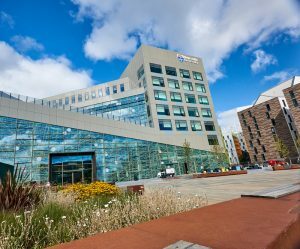 The conference will be between 23 – 26th April, and will be hosted in the new Urban Sciences Building, one of the most (if not the most) sensored buildings in the UK. The conference theme has already been decided, and will be ‘From Data to Decisions’. More details about this, the programme, abstract submission process and registration will be announced in September. We have also been busy organising the social events, from the conference reception to the conference dinner, and again we will announce more details about these soon. Our website will be going live in September, but in the mean time please follow @GISRUK on twitter for the latest announcements, follow #GISRUK2019 or follow us at @GeospatialNCL. To get in contact with any queries email us at GISRUK2019@newcastle.ac.uk or contact us on twitter. We look forward to hopefully seeing many of you hear next year! Your GISRUK 2019 conference committee. 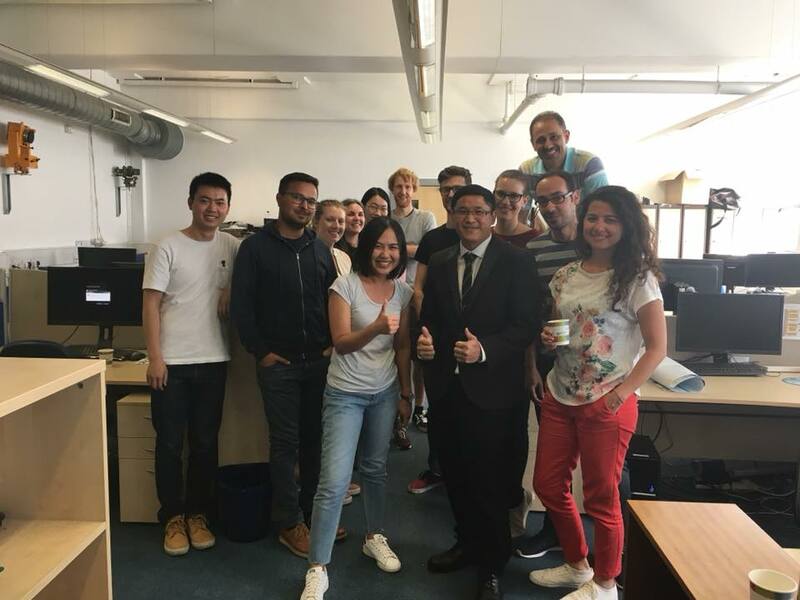 On Tuesday Polpreecha Chidburee successfully passed his viva for his thesis entitled “Landslide monitoring using mobile device and cloud-based photogrammetry” (subject to minor revisions). Professor Phil Moore (internal) and Professor Jim Chandler (external, Loughborough University) were the two examiners. Polpreecha is now returning to Thailand to take up a lectureship position at Naresuan University. Well done and good luck in the future! Landslides are one of the most commonly occurring natural disasters that can cause a serious threat to human life and society, in addition to significant economic loss. Investigation and monitoring of landslides are important tasks in geotechnical engineering in order to mitigate the hazards created by such phenomena. However, current geomatics approaches used for precise landslide monitoring are largely inappropriate for initial assessment by an engineer over small areas due to the labour-intensive and costly methods often adopted. Therefore, the development of a cost-effective landslide monitoring system for real-time on-site investigation is essential to aid initial geotechnical interpretation and assessment. In this research, close-range photogrammetric techniques using imagery from a mobile device camera (e.g. a modern smartphone) were investigated as a low-cost, non-contact monitoring approach to on-site landslide investigation. The developed system was implemented on a mobile platform with cloud computing technology to enable the potential for real-time processing. The system comprised the front-end service of a mobile application controlled by the operator and a back-end service employed for photogrammetric measurement and landslide monitoring analysis. In terms of the back-end service, Structure-from-Motion (SfM) photogrammetry was implemented to provide fully-automated processing to offer user-friendliness to non-experts. This was integrated with developed functions that were used to enhance the processing performance and deliver appropriate photogrammetric results for assessing landslide deformations. In order to implement this system with a real-time response, the cloud-based system required data transfer using Internet services via a modern 4G/5G network. Furthermore, the relationship between the number of images and image size was investigated to optimise data processing. The potential of the developed system for monitoring landslides was investigated at two different real-world UK sites, comprising a natural earth-flow landslide and coastal cliff erosion. These investigations demonstrated that the cloud-based photogrammetric measurement system was capable of providing three-dimensional results to sub-decimetre-level accuracy. The results of the initial assessments for on-site investigation could be effectively presented on the mobile device through visualisation and/or statistical quantification of the landslide changes at a local-scale. We are now looking for applications for our available fully funded PhD studentships with the DREAM CDT (Centre for Doctoral Training). DREAM, Data, Risk and Environmental Analytical Methods, is a partnership between four leading universities based within the UK, Cranfield, Newcastle, Cambridge and Birmingham, and is now into its 3rd year. The CDT focuses on the use of big data to solve environmental risks, with topics covering a wide field of research. All PhD students have a wealth of training opportunities available to them as well as regular networking opportunities with those based at the other partner universities. Newcastle are looking for applicants interested in any of the PhD’s listed below, with anyone interested asked to contact Dr Stuart Barr. Can citizen science observations improve real-time flood risk assessment – bringing the crowd to the cloud? More information on these PhD’s are available on the DREAM website, where you can also find more details on the CDT and how to apply. A flyer is also available. We have funding available for a number of PhD’s in the area of big data, risk and environmental analysis, with a start date no later than March 2017. The funding is available through the DREAM CDT (http://www.dream-cdt.ac.uk/), offering students access to world leading research teams and a large selection of training and development opportunities. This funding comes with the freedom to devise your very own reaserch project with the aid of experts from a range of fields who will help guide and support you from the developemnt of the project to the completion of the PhD. For more information on taking up a PhD with the DREAM CDT, please contact Stuart Barr (stuart.barr@ncl.ac.uk). Applications for these appointment close on the 28th November. A new job opportunity has arisen for a researcher (assistant/associate) for a 24month position working within our group. The position is tied to the recently awarded multi-million pound ITRC MISTRAL programme grant, a joint project between seven UK based universities, investigating the future of national infrastructure. The appointed person will work on the development of a building classification model for the entire UK, working primarily with Ordnance Survey data. In collaboration with other MISTRAL researchers demographic and economic profiles will then be assigned to buildings providing data to be employed across infrastructure models developed across the consortium. For further details please see the job advert. For informal enquiries please contact Dr Stuart Barr. We are pleased to announce that we have a new four year fully funded PhD studentship available in spatial data modelling with BIM/GIS. Proposed to start in September 2016, the PhD will aim to develop tools for modelling and understanding flows across a city; from the broad city-scale to within individual buildings. Funded by EPSRC, the PhD is a partnership between ourselves at Newcastle University (the Geomaticts group in the School of Civil Engineering and Geosciences) and Ordnance Survey, and affiliated with the EPSRC funded ITRC-MISTRAL programme. For more details on the PhD including how to apply, please see here. At the end of May Stuart Barr attended the launch of the ITRC (Infrastructure Transitions Research Consortium) MISTRAL (Multi-Scale Infrastructure Systems Analytics) programme, an EPSRC funded 5year programme between seven universities, including ourselves, with Stuart being one of the co-investigators. Hosted at the ICE (Institute of Civil Engineers) in London, the event presented the vision and ideas behind the new programme, the next step in infrastructure systems-of-systems analysis research following the completion of the previously funded ITRC programme. Attended by over 150 people, including representatives from academia, private sector businesses and public sector organisations, the event included speeches from Professor Jim Hall, the lead investigator on the ITRC MISTRAL project, Lord Adonis, chair of the National Infrastructure Commission and Keith Clarke, the ICE vice president. A question and answer session then followed providing the opportunity for the attendees to find out more about the ITRC MISTRAL project from the key persons involved, including Stuart. A video has since been released including snippets from some of the speakers, providing an insight into the work which will be undertaken in the ITRC MISTRAL project and the important role it can play in the future of infrastructure systems. In the latest issue of GeoConnexion UK a short article, written by Stuart Barr and Craig Robson, details the ongoing work they are doing to develop the UK’s first national infrastructure database. Over the course of the 5 year ESPRC funded ITRC MISTRAL programme, by 2020 a national infrastructure portal will be developed as a resource that will be open to those across academia and industry as well as policy makers. This will provide access to infrastructure datasets and simulation and modelling results, including those from the already completed ITRC project, such as the results from the first national infrastructure long term planning tool. Some of the software developed and employed in the analysis undertaken will also be available under open licenses allowing the research to continue beyond the life of the ITRC MISTRAL project. Both are based in the Geomatics group in the School of Civil Engineering and Geosciences at Newcastle University, with Stuart a lecturer on the two undergraduate degrees offered, BSc Geographic Information Science and BSc Surveying and Mapping Science, while Craig is a recent graduate of the GIS programme.